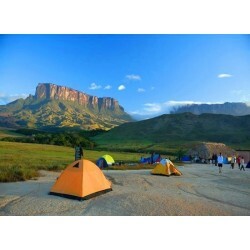 This hiking trip will take you to Mount Roraima, an incredible place with unbelievable table mountains and unforgettable sounds of nature, being surrounded by deep silence and a mysterious fog. The more you hike the more you realize that there is so much to discover. This is a wild place, where the time stopped. A mountain which looks alive, where slumbering sensations raise from your souls, showing how strong and fragile we are. The reflections come naturally, even for the more experienced traveler, especially if one stays more at the top. This hiking trail is considered moderate. It is done on a rough irregular surface with elevations below 3000 meters, climate adaptation or climbing techniques not being necessary.